In March 2017, ATREG facilitated the successful sale of Cypress Semiconductor Corp.’s operational 200mm fab located in Bloomington, Minn. to SkyWater Technology Foundry. 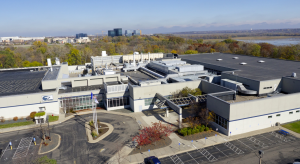 As the industry’s most advanced U.S.-based and U.S.-owned trusted foundry, SkyWater specializes in the development and manufacturing of a wide variety of differentiated semiconductor manufacturing solutions. The company offers advanced development capabilities alongside volume production, which enables its customers with unique technology needs to innovate and scale. So one year on, where is SkyWater Technology Foundry at? We recently sat down with President Thomas Sonderman for an update. What has been your main business objective for the facility since the acquisition from Cypress last year? We have been focused on transforming our organization from an integrated device manufacturer as part of Cypress to a pure-play technology foundry as SkyWater. Our transformation has made tremendous progress as we build our base of customers through a differentiated model that combines advanced development with manufacturing at scale. The market acceptance to our new foundry model has be very encouraging so far. Have you made any significant changes since the acquisition? We have made significant changes in our culture and structure to embrace a customer-centric foundry operating model. We are in the early stages of this journey and we will continue to evolve our business in these areas in the second half of 2018 as we streamline our operations and stand up the core capabilities needs to be an independent technology foundry. SkyWater’s facility was re-certified as trusted by the U.S. Department of Defense after the purchase from Cypress. Can SkyWater describe how it fits into the trusted foundry space or how it differentiates from other providers who are producing wafers for the government? SkyWater has a long and successful track record in supporting the U.S. government as a trusted foundry. As the only U.S.-owned and U.S.-based pure-play foundry, we offer the government a secure, proven domestic partner for strategically important technology and manufacturing initiatives. Our model of combining advanced development with high-volume manufacturing is well suited and optimized for the needs of the U.S. government. We will continue to invest in this area moving forward. What are your greatest strength and your greatest weakness? Our greatest strength is our operating model of blending advanced development and manufacturing at scale. We partner with our customers in a unique manner where they get the benefits of an IDM-style collaboration as a foundry partner. Our weakness is that we are a new entrant to the foundry landscape and as such, we need to grow our brand and profile with our target customers. We are establishing and asserting leadership in a new category of semiconductor manufacturing – the technology foundry. Do you have any product, technology, or capability expansion plans? If so, in what areas? We will continue to invest in our technology portfolio to serve a broader range of customers. We will balance that out with looking to optimize manufacturing efficiency and capacity within our manufacturing operations. We will also recruit new and experienced talent to grow out key areas of our business in support of our customers. Where do you see most of your future growth coming from? We see the enablement of solutions for the U.S. government as a key ingredient to our growth formula. Driving the development of next-generation cloud technologies such as quantum computing / superconducting and photonics is also critical. Becoming a preferred supplier in the automotive and medical device ecosystems as well as other areas of Internet of Things (IoT) are equally important. All of these areas create strategic, long-term opportunities for our business. 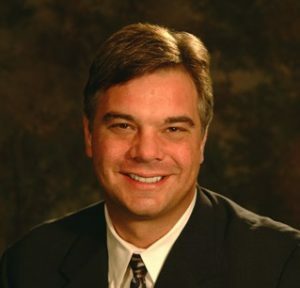 Thomas has served as the President of SkyWater Technology Foundry since October 2017. Prior to joining the company, he worked as Group Vice President and General Manager for Rudolph Technologies’ Integrated Solutions Group. Under his leadership, the business unit realized three years of consecutive revenue and margin growth while solidifying a dominant market share position. Thomas’ foundry experience began at GLOBALFOUNDRIES where he served as Vice President of Manufacturing Technology. 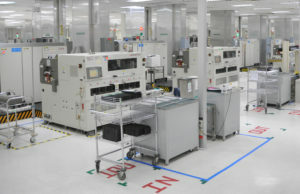 Formed as a spin-off of AMD’s manufacturing operations, GLOBALFOUNDRIES is a $4 billion full-service semiconductor foundry serving more than 150 integrated circuit customers worldwide. A key contributor to the spin-off, Thomas built and led a team that transformed AMD’s manufacturing operation into an independent manufacturing powerhouse able to effectively compete with companies 10 times its size. During his two decades at AMD, Thomas held numerous executive management and engineering positions. Prior to the spin-off, he served as Vice President of Manufacturing Systems Technology with global responsibility for the automation and associated manufacturing systems in the company’s wafer fabrication and assembly operations. The author of numerous articles about manufacturing technology, Thomas is a highly sought-after expert on semiconductor industry issues who has been quoted in the New York Times, Wall Street Journal, Fortune Magazine, Investor’s Business Daily, CNET, and DigiTimes. A champion for innovation within the semiconductor industry, Thomas holds 47 patents and currently serves on the Executive Board for the American Society of Semiconductor Manufacturing and SEMI’s SMART Manufacturing Council. Thomas received a B.S. degree in Chemical Engineering from the Missouri University of Science and Technology and an M.S. degree in Electrical Engineering from National Technological University. 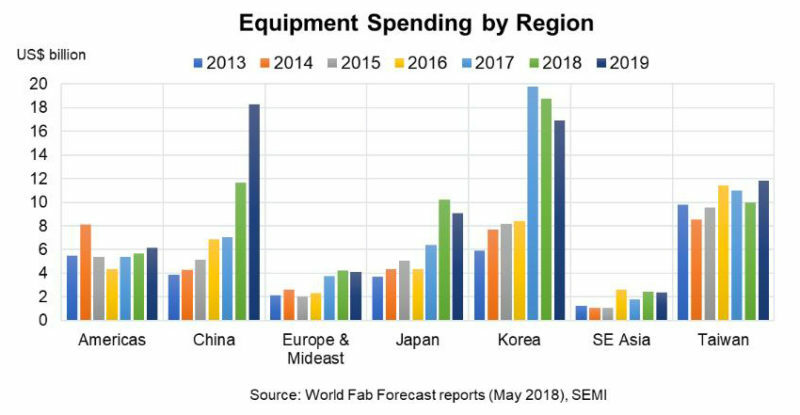 On June 12th, SEMI released the latest update of its World Fab Forecast report, announcing that the semiconductor industry is nearing a third consecutive year of record fab equipment spending with a projected growth of 14% (YOY) in 2018 and 9% in 2019 (including new and secondary fab equipment). Korea and China are clearly leading the charge, followed respectively by Taiwan, Japan, the Americas, EMEA, and SE Asia. China plays a significant part on the global semiconductor equipment scene. With a forecast increase in equipment spending by 65% in 2018 and 57% in 2019, Chinese-owned companies backed by generous government subsidies are building a considerable number of new fabs that will start equipping this year. The companies are expected to double their equipment investments in 2018 and again in 2019. According to SEMI’s latest numbers, global semiconductor manufacturing equipment billings reached a historic high of $17 billion for Q1 2018, surging 59% in March to end the quarter with an all-time monthly high of $7.8 billion. The $17 billion in quarterly billings shatters the previous record set in Q4 2017. Q1 2018 billings are 12% higher than the previous quarter and 30% higher than the same quarter a year ago. SEE YOU AT SEMICON WEST! Several members of the ATREG team, including our President & CEO Stephen Rothrock, will be attending SEMICON West in San Francisco from July 10 to 12. If your company is planning the divestment or acquisition of infrastructure-rich brownfield manufacturing assets or cleanrooms or looking for a brand-new greenfield opportunity, extra loading capacity, or secondary fab tools, please email us to set up an appointment with one of our advisors at the show and we’d be happy to discuss your needs and identify appropriate solutions.